Spinning tops and yo-yos have long fascinated cultures around the world with their unexpected, graceful motions that seemingly elude gravity. We present an algorithm to generate designs for spinning objects by optimizing rotational dynamics properties. As input, the user provides a solid 3D model and a desired axis of rotation. Our approach then modifies the mass distribution such that the principal directions of the moment of inertia align with the target rotation frame. We augment the model by creating voids inside its volume, with interior fill represented by an adaptive multi-resolution voxelization. The discrete voxel fill values are optimized using a continuous, nonlinear formulation. Further, we optimize for rotational stability by maximizing the dominant principal moment. We extend our technique to incorporate deformation and multiple materials for cases where internal voids alone are insufficient. 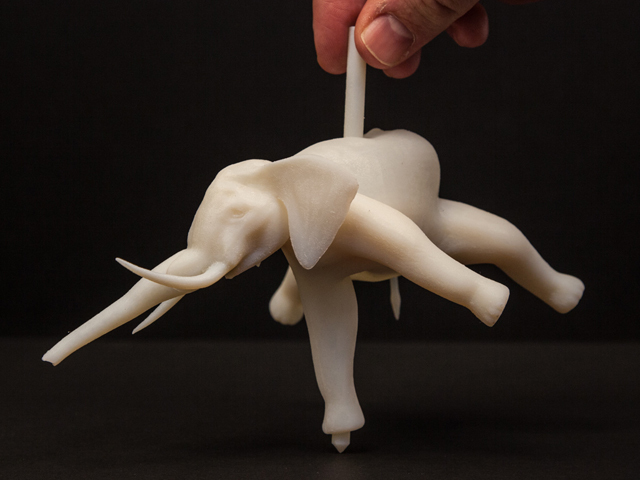 Our method is well-suited for a variety of 3D printed models, ranging from characters to abstract shapes. We demonstrate tops and yo-yos that spin surprisingly stably despite their asymmetric appearance. We thank Maurizio Nitti for model design; Romain Pré́vost for Make-It-Stand comparisons; Alexander Sorkine-Hornung, Kaan Yü̈cer and Changil Kim for video and photo assistance; Ronnie Gänsli for metal casting; Alec Jacobson for the posed Elephant model and skinning demo [Jacobson et al. 2012] for Armadillo poses; Romain Prévost and Amit Bermano for print preparation. This project was supported in part by the ERC Starting Grant iModel (StG-2012-306877). Emily Whiting was supported by the ETH Zurich / Marie Curie COFUND Postdoctoral Fellowship.